The Zero Energy Lab is the new home for the Center for Sustainable Building Research. It is designed to embody the values practiced within it. The labs are designed as a third story addition to Rapson Hall. By focusing on luminous and thermal performance, the design for the new labs employed iterative processes of analog and digital energy and daylight modelling. The new lab is a 24,000sf 3rd floor addition to Rapson Hall on the UMN-TC campus. The addition is the new home for the Center for Sustainable Building Research. The program includes labs, offices, studio classrooms, and outdoor courtyards with the goal of achieving Net-Zero energy. 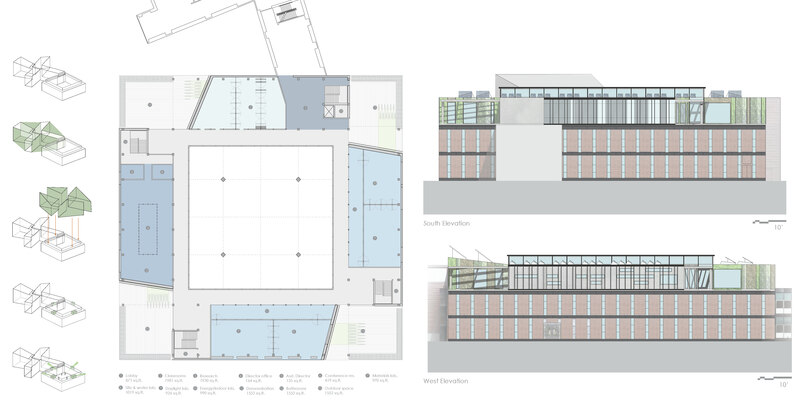 The design process began with analyzing the existing building and the Steven Holl addition. We were then able to create spaces and circulation that related to the rigid symmetry of the original building, but we responded to the asymmetrical Holl plan with our outdoor space placement, which gives a strong sense of orientation for the occupants. 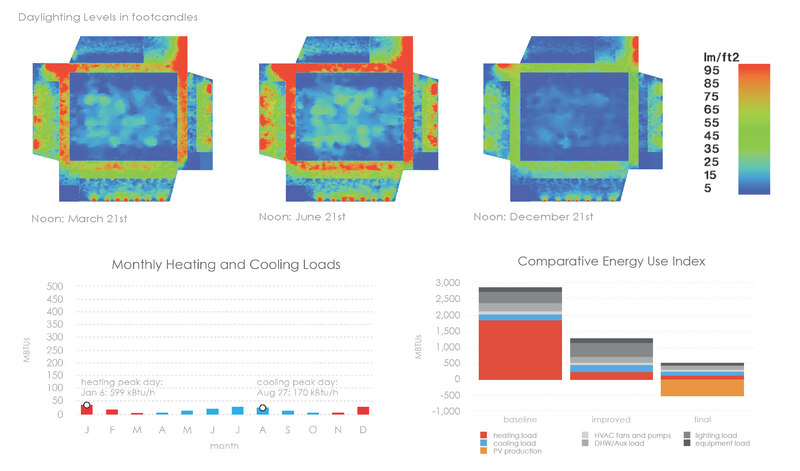 Parametric energy modelling was used to optimize daylighting and thermal performance. By combining physical modelling with digital energy modeling through IES <VE> we were able to establish a balance between qualitative and quantitative measures of light and space. In order to reach zero-energy a 2500sf pv array was employed. In addition, we established an understanding that the future of sustainable architecture hinges on new perception of comfort. Maximum comfort was achieved in spaces occupants spend the most time, but the thermal qualities in circulation spaces for instance fluctuate with the seasons.